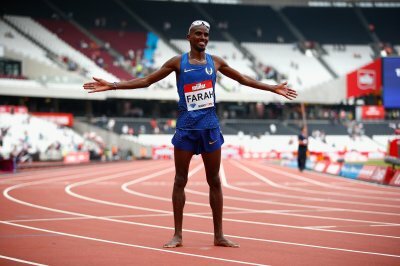 23rd July 2016 – Mo Farah (GBR) sent a warning to all his rivals that he is ready to defend his Olympic titles in Rio as he won the 5000m at the IAAF Diamond League event in London. Back in the stadium where he was crowned double champion 4 years ago, Mo ran positively from the start and closely followed the pacemakers through 3k in 7:52. From then on, his only opposition was the clock and he looked majestic in running a sub 57 second last lap to break the 13 minute barrier clocking 12:59.29, the fastest time in the world this year. Another man who will be looking to defend titles in Rio, is the world’s fastest man Usain Bolt (JAM), and he dispelled any injury and fitness concerns with a 200m victory in 19.89 seconds. Matthew Hudson-Smith (GBR) is heading to his first Olympics but he will head there in confident mood as he ran a well-judged 400m race to take victory in 45.03 seconds. A 400m runner heading to her fourth Olympics is Christine Ohuruogu (GBR) and she received a very warm welcome from her local crowd before placing fifth with a seasons best performance. Dina Asher-Smith had a busy two days as she finished fourth in a high quality women’s 100m, running 11.09 seconds in the final. This came the day after she ran the third leg for the British team that set a new national record of 41.81 seconds while winning the women’s 4x100m relay. In the middle distance events, Vincent Kibet (KEN) was narrowly beaten into third place in the Emsley Carr mile. Tom Lancashire (GBR) ran a seasons best of 3:56.44 for ninth. Winny Chebet (KEN) showed her Olympic preparation is going well as she dipped inside 2 minutes for the first time this season when taking fourth in the women’s 800m. Two members of the US Olympic Team had their final run outs before Rio at the American Track League event in Houston. Jenna Prandini (USA) completed the sprint double running times of 11.21 in the 100m and 22.42 in the 200m. Matthew Centrowitz (USA) stepped down to the 1000m and placed second in 2:20.20.